Summer Bulbs for Southern Gardens: Crinums. Zones 7 through 11. In high summer Crinums are often seen blooming in old Southern gardens. Like their cousins amaryllis, crinums are also within the Amaryllidaceae family. Blooming still In abandoned gardens they may mark a pass- a- long transaction of many years ago - an unwritten history of gardeners now gone. Crinums are often found in historic cemeteries. 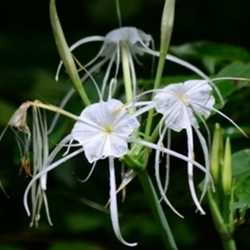 Native crinums or swamplilies may be seen blooming by the hundreds along rivers. Crinums have been grown in Southern gardens for more than 200 years. While there are native crinums, many in early gardens were species from Africa. Crinums are native to Africa, Southern Asia, Australia, and are found growing along rivers in the Southern United States. 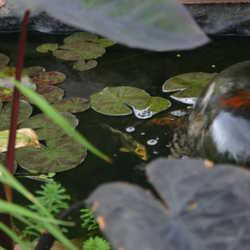 The plants are adapted to a wide range of conditions and different species can thrive in aquatic or desert environments. Gloria Jahoda in The River of the Golden Ibis has described in detail the environment of Crinum americanum, the American hardy swamplily, along the Hillsborough River in Central Florida. 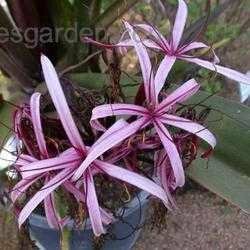 [See Crinum americum in thumbnail.] It is rare that we have a detailed description of the native habitat of a plant we only know from gardens. FIGURE 1. Crinum Augustum. Giant Spider Lily 'Queen Emma'. The genus Crinum is one of sixty genera within the family Amaryllidaceae. 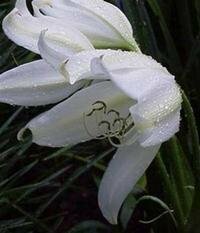 There are some 180 species within the genus Crinum. Crinum flowers do resemble those of their cousin the Christmas pot plant amaryillis - which also naturalize nicely in Southern gardens. But most crinums are much larger than amaryillis. Some can grow to 7 ft in height [see Figure 1]. 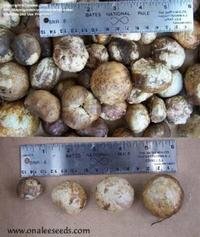 The plants grow from large bulbs, which may be up to 20 lbs in size. So they are plants that can make a landscape statement. Crinums are often adapted to wet or aquatic environments as are the Southern swamplilies described above. Some species proliferate along streams and rivers, while a few are adapted to desert conditions. Some species are quite hardy and have been grown as far north as Zone 5  Some species, such as crinum latifolium  have significant medical value. FIGURE 2 . Crinum ugandense. 'Cosa Rican crinum'. FIGURE 3. Crinum fimbriatulum. Milk and Wine lily, Confederate lily. 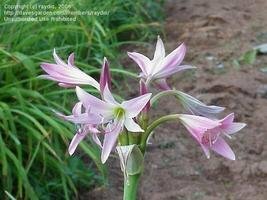 Recent DNA studies add another dimension to the story of how Crinum lilies got to be where they are. In a study of genetic sequencing published in 2003, Meerow, Lehmiller, and Clayton identified three clades or genetic groups of Crinum species. Meerow et al. state that earlier classifications which supported a number of sub-genera within the genus Crinum are not supported by the genetic data. Their interpretation is that these genetic clades represent bioregional groups. Their genetic study indicates that all crinums originated in Southern Africa. American crinums, North African and tropicals comprise one of the clades. 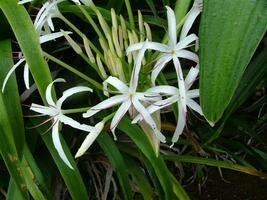 An early group represented by Crinum flaccidum appeared in Australia and today this species is considered to be endemic to central Australia. A third group is made up of Madagascar, Australasian, Sino-Himaloyan, and Southern African species. While various land bridges connecting Africa with other continents have been suggested as routes for the dispersal of crinums throughout the subtropical world, Meerow et al. suggest that the dispersal could have been made in large part by crinum seeds traveling on ocean waves. They point out that the seeds are salt resistant and capable of floating long distances without being damaged. The corky covering waterproofs the seed and protects it (see Figure 10). 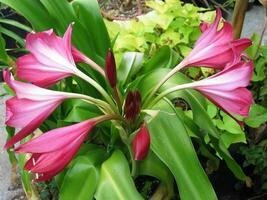 Crinums may be propagated from seeds, from underground offsets from the main bulb, or from bulb cuttings. Not all crinums are propagated the same way, however. Not all crinums set seed. According to Les Hannibal, "Few hybrids will set seed, but a number have viable pollen." The general rule is that species are propagated by seeds, while hybrids are propagated by offsets from the main bulb. Andy Cabe  Curator of Horticulture, Riverbanks Zoo and Gardens. Columbia, S.C. describes a third method. He makes cuttings from the basal plate of the main bulb. Werner Voigt's  instructions for sowing seed of Crinum campanulatum would hold for most aquatic crinum species. Avon Bulbs, UK  provide planting instructions for the hybrid crinum, Crinum x powelli. Propagation is by offsets from the main bulb. Dig down carefully then separate the offset cleanly from the mother bulb. Dig the hole 12 inches deep and plant the bulb so that the tip protrudes at the surface. Species Crinums are propagated by seeds produced in late summer. The seed should be as fresh as possible when collected and planted immediately. Here are the instructions for propagating seeds supplied with Plant Files photos by onalee for the Crinum asiaticum, the White Giant Crinum Lily. Acording to onalee (see Figure 10). Figure 11. Sprouted crinum seed. "Plant when fresh by just pressing into soil: leave top above soil line. Keep damp, but not soggy and warm. Germination about 30 days." Figure 11 shows a White Giant Crinum Lily bulbil/Seed that has begun to sprout. Onalee says, The "Leaf is pointed; root is rounded." A note about "rescuing" heirloom plants from house sites or country road sides. Get permission. Many people think it is fun to spend an afternoon collecting plants from National Forests, pastures, or abandoned house sites and even houses where it seems no one is home. When you spot a plant, that you would like in your personal garden, consider if an offshoot, or seeds would not be as valuable to you as destroying the whole plant. Consider that it might be the last one on earth. Then ask, before you dig. * The concept that a plant is native to, or endemic to a certain place is somewhat obscured by genetic analysis. In this case, genetic analysis shows that all crinims originated in Southern Africa, as the discussion will show. Thumbnail. Crinum americanum. Southern Swamp Lily. American Crinum. alhanks. february 8, 2002. Plant Files. Figure 1. Crinum augustum. Giant Spider Lilly, Queen Emma. PotEmUp. November 15. 2005. Plant Files. 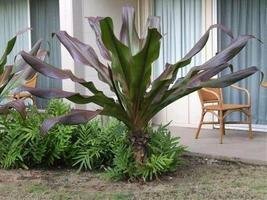 "Hotel landscaping. Wilea, Kauai". Figure 2. Crinum ugandese. 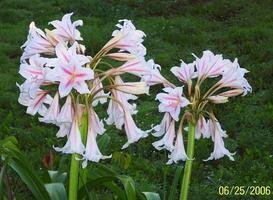 Puerto Rican crinum. aking. May 23, 2004. Plant Files. "Flower is short lived but spectqacular in the garden." Figure 3. Crinum fimbriatum. Confederate Lily. Milk and Wine Lily. TulsaRose. July 19, 2006. Figure 4. Crinum peduncalatum. swamp lily. gearge4tax/PotEmUp. May 3, 2000. "Limahuli National Tropical Botanical Garden - Ha'ena, Kaua'a, Hawaii." Figure 5. Crinum amoenum. TomH3787. July 13, 2007. "Picture taken July 8th at Plant Delights Nursery, Raleigh NC". Figure 6. Crinum procerum. 'splendens' Dave. May 3, 2004. Figure 7. Crinum 'Stars and Stripes'. Cape Coast Lily. dutch lady. May 20, 2008. Plant Files "Naples Florida". Figure 8. Crinum x powelli. raydio. October 20, 2006. Plant files. "A fine hardy "workhorse" of a Crinum. 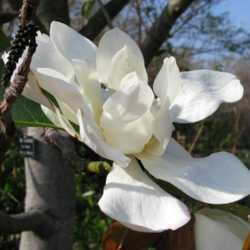 Very easy to grow and can bloom reliably even under poor cultivation." Figure 9. Crinum Ellen Bosanquet. Calif_Sue. Sept 12, 2006. Plant Files. Figure 10. Crinum asiaticum seeds. 'Giant white crinum spider lily. onalee. 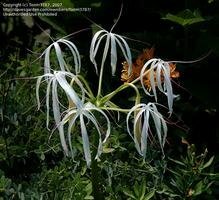 "Seeds/bulbils for the Giant White Crinum Spider Lily. 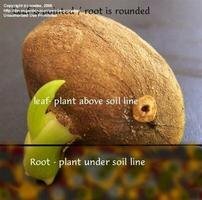 Plant when fresh by just pressing into soil: leave top above soil line. Keep damp, but not soggy and warm. Germination about 30 days." Figure 11. Crinum asiaticum. White Giant Crinum lily sprouted seed. onalee. July 29, 2006. 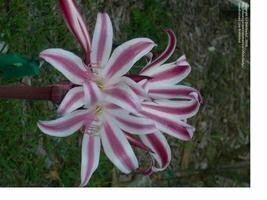 "White Giant Crinum Lily Bulbil/Seed that has begun to sprout - directions on how to plant a seed that has begun to sprout above ground or before planting. Leaf is pointed: root is rounded." Milk and Wine Lily, Confederate lily, Crinum fimbriatulum. doofus.org/Crinum See Figure 52, according to the classification offered by Hannibal. C.W. Fennell and J. van Staden. Abstract. Crinum Species in Traditional and Modern Medicine. Journal of Ethnopharmacology. Volume 78, Issue 1, November 2001, Pages 15-26. Andy Cabe. Propagation of crinum by cutting the basal plate. www bulbsociety.org. I am a retired archeologist and curator of an historic house museum. I live in Greensboro, Alabama, a small rural historic Southern town, with my two dogs, a rabbit and (by recent count) two cats. I am upgrading a 100 year old neoclassic house and clearing and planting my two-and-one-half acre property. Of plants, I love roses best of all. The Color White in Folklore and in the Garden Choosing Plants for Your Water Garden Spider Lily, a Fall-blooming Stunner!